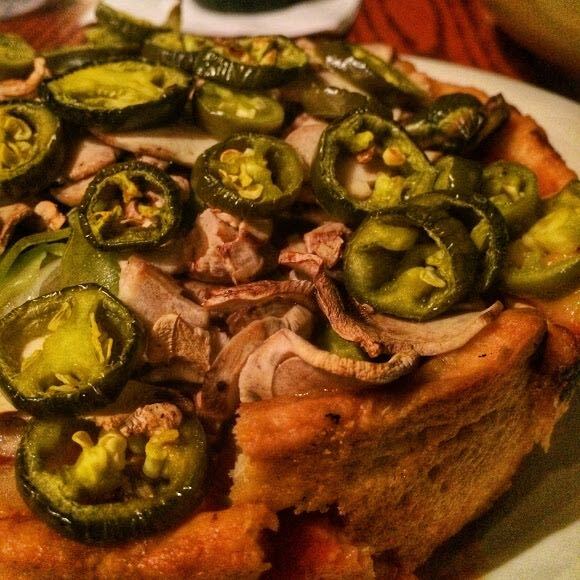 You are here: Home ∼ Where is the Best Deep Dish Pizza in Chicago? 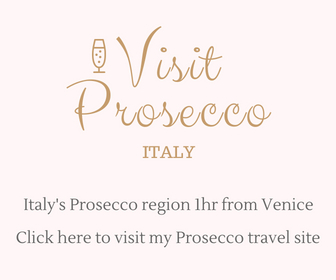 Post written in collaboration with Expedia.com. Pizza eaten by me. 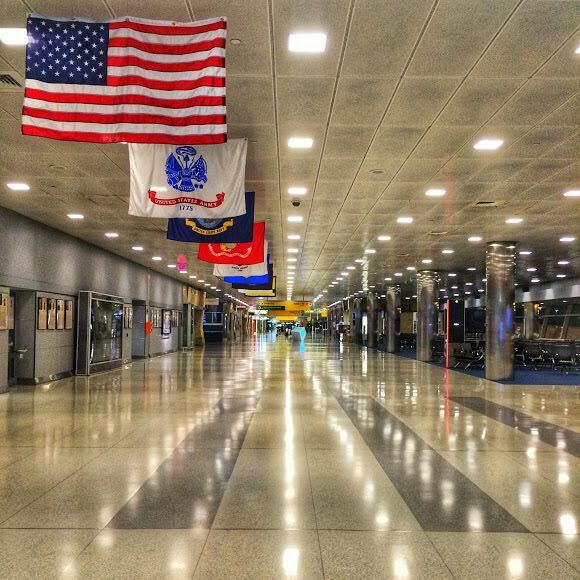 To say I was jet-lagged when I stepped off the plane at O’Hare airport would be a vast understatement. I’d zig-zagged across the Atlantic twice in two weeks with stops in London, Istanbul, Bologna and New York. Not sure which way was up, I arrived in Chicago on a crisp October morning, craving a week in bed…during the only week I had to explore the city. Cracking open the cloud and searching for the glorious silver-lining, I remembered that jet-lag leaves me craving carbs and Italy had provided a residual hankering for pizza. And the solution to both of these urges surrounded me in Chicago, one of the most famous pizza cities on earth. 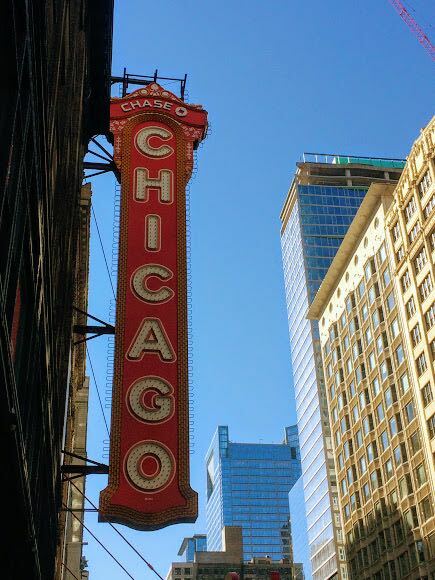 Consequently, for the first few days in Chicago as I fought my bones out of bed and onto the city streets, I did one of the best activities anyone can do in the windy city (apart from keep their long hair safely tied back), I ate deep dish. For the uninitiated, Chicago-style pizza is created in a deep pan and is more similar in style to a pie. The crust sits at the bottom and the depth is filled with cheese, tomato, meats and vegetables. This sets it apart from most other pizzas around the globe where you typically get a flat bread which is topped with a thin spread of tomato sauce, cheese, meats and vegetables. As for Chicago’s claim to deep dish pizza fame, the story and the dish came about courtesy of two brothers. Since before the turn of the 19th century, Neapolitan immigrants had been crossing the Atlantic from Italy in search of work. And they bought their native flavours and recipe books with them. And therein they created a food icon. And ‘with more cheese than people could believe‘ how could they not? * there’s been a significant spat between the brother’s as to which of them created the Chicago deep pan pizza. The internet will give you whichever answer you want, if you choose to pick a side. I’d rather pick another slice of pizza so I’m going to leave both their names on the ‘made by’ label. In my quest to discover the best deep dish pizza in Chicago, I managed to visit three pizza joints. 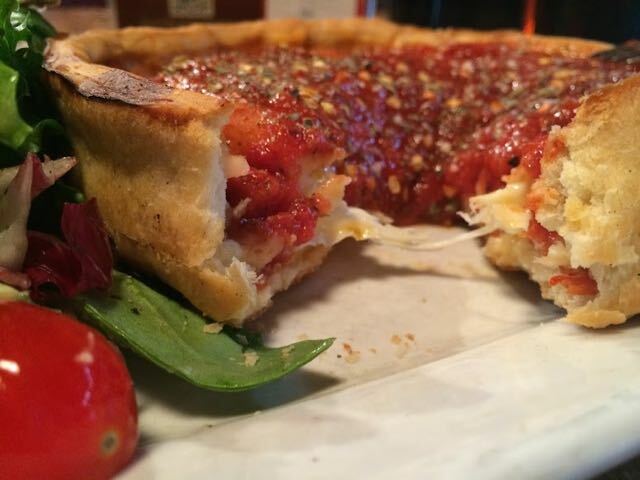 The first two served the classic Chicago-style pizza that has become one of the city’s icons. The third was a mistake from start to finish (that’s what I get for trying to add a non-Chicago-style pizza into the comparison) so I won’t be mentioning it here, and you’ll thank me for that. Still, choosing where to try the deep pan was a challenge all in itself. Obviously, I turned to the internet, where I quickly drowned in lists of top 5’s, top 10’s and even a top 50. There were the original pizza places, the ‘most popular’, the ‘with a twist’, the ‘craft-creators’ and the ‘urban trendy’s’. If I learned one thing from my pre-pie research it’s that everyone has an opinion and Chicago is not short on great pizza parlours to choose from. This gave me some quandary until I returned to the root of the issue. I wanted to taste the original and I wanted to taste the best. That led me to two places: Uno’s and Giordarno’s. 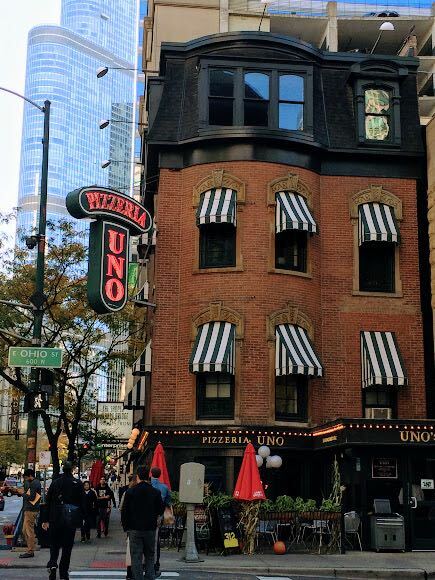 Uno’s, you will recognise as the restaurant that originally belonged to the (squabbling) brothers who invented Chicago’s deep dish pizza. Established in 1943, the brand has exploded into a staggering-sized chain with over 100 restaurants around the world (popular in Honduras, I understand). However, the original restaurant still stands in its original spot in Chicago and it is there that I went for my first tasting. Giordano’s came a little later to the Chicago pizza scene. Established in 1974, the story of this restaurant has a certain synergy with that of Uno’s. Again the work of two brothers, Efren and Joseph Boglio, the pair bought their 200 year-old family recipe to Chicago from their home near Turin in Italy. Based on the family’s well-loved ‘Easter pie’, scarciedda, the brothers crafted this version of the deep dish pizza because they too thought they could improve on the Chicago pizza scene. Since opening, Giordano’s has been named the best deep dish pizza in Chicago so many times I’d require a new article to list the accolades. But it’s safe to say that while Giordano’s may not claim title as the original, it is great competition as being one of the best. And so my pizzeria choices were set. 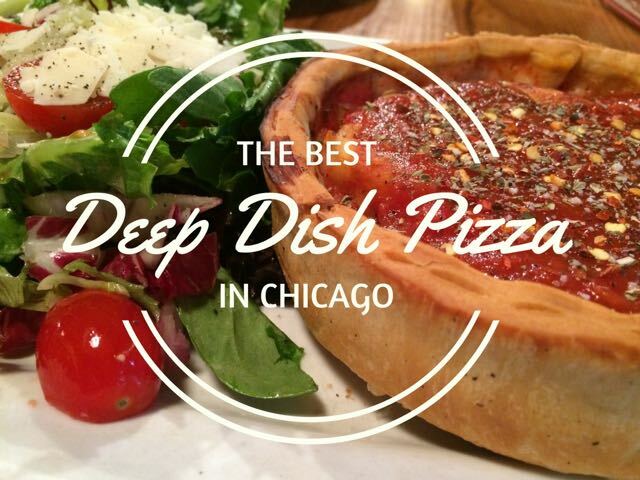 What’s the difference between deep dish and stuffed pizza? I’m sure there are a thousand pizza aficionados who’d queue up to give me a stern talking to for what I’m about to say but I personally didn’t notice much difference in style between the deep dish pizza (that I tried at Uno’s) and the stuffed pizza (that I tried at Giordano’s). In fact, it wasn’t until I took a closer look at the respective websites to write this post that I realised there is, apparently, a difference. However, if you are interested, the main difference seems to be that the stuffed pizza has a second ‘dough’, which tops the pizza like an actual pie. However, as stuffed pizzas can be slightly deeper in terms of toppings and because the second dough is slathered with more tomato sauce and cheese, I really didn’t notice any taste difference. How easy is it to get a table? Thanks to it being so close to my hotel that I had to walk past it to eat elsewhere, Uno’s was first on my list of pizzas to try in Chicago. Double thanks to my jet-lag, I was banging down the door just before it opened (at 11 a.m.), which turned out to be a good thing. I ate at the original Uno’s site on East Ohio street and I didn’t appreciate until later how lucky I was to simply breeze up and stroll right in. It helped that it was first thing on a Tuesday lunchtime. Every other time I walked past this place, which I did a couple of times a day, there were queues out the door and the reviews online seem to confirm it. The interior of this 1940s restaurant was exactly as I would expect – traditionally decorated, cramped, dark and, by the time I left, bordering on boisterous. Compared to modern pizzerias that are all chrome and no-soul, Uno’s was everything I love about older restaurants and had more character oozing from within its walls than it had cheese oozing from its pies. I was warned when I sat down that the pizzas were cooked fresh and there would be a wait, which was fine by me: nothing sinks my heart more than the sound of a microwave ping followed by the rapid appearance of your order. Being one of the first customers, my pizza arrived in 20 minutes and I occupied myself with my Kindle in the meantime. However, I have read online that orders more commonly take between 40 minutes to an hour to appear at your table. Combined with what can be an hour to wait to sit down, this would be too much for me – I wouldn’t wait an hour for a Michelin star menu, let alone pizza. Fortunately, the smart folks at Uno’s will let you order your pizza while you wait for your table. Not a bad compromise. I was dining alone and I ordered the Numero Uno individual pizza, which is 7″ and comes with sausage, pepperoni, onions, peppers, mushrooms, chunky tomato sauce, mozzarella and Romano. And, just because my dad has instilled a fierce chilli tolerance in me, I added an extra topping of jalapeños. I also ordered a side-salad to balance out the cheese and enhance my immune system after all my long-haul flights and, on the recommendation of the waiter, I ordered a Lake Shore Lager, which is a local American Pale Ale. The personal size pizza looked so damn cute when it arrived at my table that it took me a good minute to commit to eating it rather than spiriting it away in a box and admiring it daily. When I eventually sunk my knife and fork into the pie I was both fascinated and excited to see an avalanche of tomato and cheese seep out. On first bite I was in heaven. 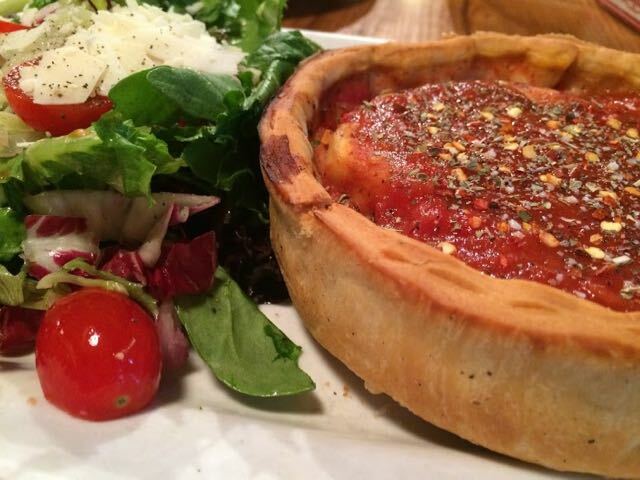 The Chicago deep dish pizza is made with a shortcrust pastry that is closer to a pie than standard pizza dough and the buttery flakiness won my tastebuds over in one bite. The tomato sauce was thick and intense and would have been too close to tomato puree for me had it not been softened by the oozing cheese. This was hands-down one of the best pizza experiences of my life…until I got about half way in. It’s not that the pizza became bad, it really didn’t – it was truly divine – but all of a sudden I was overwhelmed by how rich it all was with the buttery crust, the concentrated tomato and the liberal cheese. The jalapeños and the side salad were the saving grace that allowed me to swallow down my last bites before, just under half way through, I admitted defeat. The beer didn’t help and in hindsight I should have stuck to water. Still, putting my knife and fork to rest, I sat back and admired Uno’s good work. I’d made a great attempt at my first deep dish pizza in Chicago, I’d stopped on the right side of fit-to-burst and I was inspired that as well as experiencing the original, I may well have just tasted the best deep dish pizza in Chicago. But before I decided, I had a competitor to try. You can find the official Uno’s website here. The pizza God’s were once again on my side and I strolled right into Giordano’s. This time it was Thursday and I was on the early side of mid-day (about 11:45 a.m) which I was beginning to feel was the best time to hunt down the best deep dish pizza in Chicago. As with Uno’s, there are reports of long queues as well as a 45 minute wait for pizzas but you can also order before you sit. I ate at the Giordano’s on North Rush Street, which is their flagship pizzeria. This is not to be confused with the original pizza restaurant, which is somewhere on the south side of Chicago at a location that Giordano’s itself is very coy about naming on its site and which the internet consistency fails to agree on. (If anyone knows the answer, please share it with me in the comments below). Inside, the flagship Giordano’s was everything Uno’s was not – light, bright, airy and spacious. The tables were sufficiently spread out and I didn’t need to change the lighting on my Kindle to read. And I was disappointed by that. Between the two restaurants, Giordano’s felt much more like a Pizza Hut than a piece of pizza history and although it was probably for the best that the 1970’s vibe hadn’t been obtained, I knew I was dining in a chain from the second I stepped through the doors. That said, there are lots of people out there who didn’t dig the whole Uno’s dark interior and found the place way too noisy. If that’s you, Giordano’s will be right up your street. And, if you have kids that like to get up and down to run off some pizza, this is going to be a better spot. ‘Pizzas take 45 minutes to make’ is the prolific warning you’ll find online yet mine was placed on my table in under 15 minutes. I remember making a mental note of this at the time and I have just checked the time stamps on my photos to confirm it. What that means in terms of the freshness of the pizza, I don’t know. I don’t believe it was pre-cooked or frozen. I suspect it’s just a lot easier and quicker to cook a small deep dish pizza when you don’t have a backlog of customers. Also: the pizza God’s – shining on my in Chicago? I was dining alone once again, which ordinarily doesn’t bother me… until I find that half of the menu is off limits to solo diners. Unlike Uno’s, Giordano’s only offers one individual size pizza. The lonely, boring cheese – no ‘Special’, ‘Chicago Classic’, ‘Meat & More Meat’ or ‘Bacon BBQ Chicken’ for me. Sure, it’s possible to add extra ingredients but I was sufficiently miffed by the exclusionary solo diner approach that this martyr stuck to the plain cheese. I added a side salad for nutritional balance and, having learned my lesson from Uno’s, I ordered water only, wondering if a could beat my record and eat the whole (this time 6″) pizza if it was just cheese and I didn’t have a beer to bloat me. Spoiler: I couldn’t. With one deep dish pizza experience in hand, I wasn’t so surprised this time by the crust, cheese, tomato ratio. But I also didn’t feel the same magic as I did with my first bite at Uno’s. Yes, the crust was good, the cheese was gooey and the tomato very flavourful but it was nowhere near as rich as what I’d tasted before. On the plus side, I didn’t get knocked out by the same sensory overload as I had at Uno’s, which meant that, although I still wasn’t able to finish the whole pie, I consumed more of it. I also had a more consistent experience – I didn’t start to feel increasingly more queasy with each additional bite as I had at Uno’s. Overall, it was a darn good deep dish pizza and I couldn’t deny it. On the other hand, the taste was not nearly as sublime or as memorable as those first few mouthfuls at Uno’s. 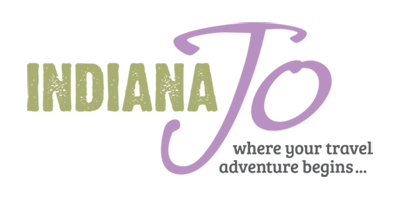 You can find the official Giordano’s website here. 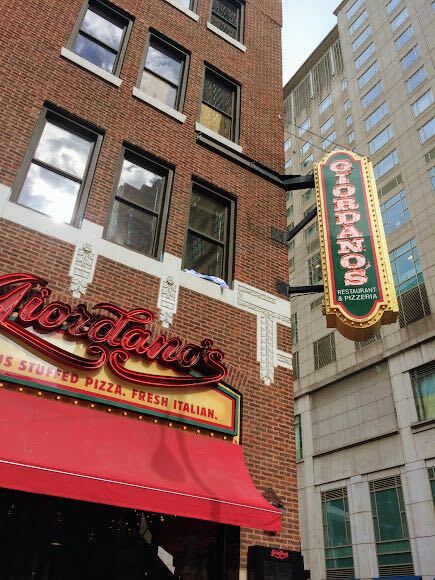 Which pizza is better – Uno’s vs Giordano’s? Like anything involving taste, it will always come down to personal preference. For me, Uno’s won. Why? If you’re new to Chicago style pizza, let me give you a chocolate-based analogy. Cadbury’s chocolate is a brand I can consume by the (almost) truck load – just ask the Easter bunny. It’s an enjoyable taste that’s reliable and consistent right down to the last flake of that family-sized bar. But then you have the chocolates created by the Belgians and the Swiss. Delectable, divine and likely to leave you feeling over-indulged before you get half-way through a small piece. To me, that was the difference between Uno’s vs Giordano’s. The former was the fine chocolate; the latter offering the more consistent and predictable taste. And, it turns out I like my pizza just like my chocolate – for the taste and pleasure I can derive from just a few bites of something rich and indulgent, I’ll take the risk of overwhelming my tastebuds. In a world where average flavours abound, I’d prefer the experience of somewhere like Uno’s every time. Of course, I accept that it’s not possible to determine the best deep dish pizza in Chicago from just two pizzas but I’ll commit to this as a work in progress and the next time I’m jet-lagged in Chicago, I’ll get a few more deep dish pizzas under my belt. Literally. And yes, this is a list of the most famous, non-indie places in Chicago but the trend-setters and curious choices I’ll have to save for another time. With my carb cravings satisfied, my jet-lag fading and Italy starting to feel like a distant dream, I finally got around to walking off my pizzas. Here are some of Chicago’s top things to do besides eating deep dish pizza. Stare at the skyscrapers. Outside of New York, these are some of the most impressive I’ve seen in the USA. Get panoramic views from the Skydeck of Willis Tower (formerly Sears Tower). It’s the tallest building in the city and the 2nd tallest in the USA. If you’re fearless enough, there’s a four-foot glass box you can step out onto. Get panoramic views from the 360 Chicago Observation Deck of the John Hancock Centre. A still very tall alternative to the Willis Tower if the queues are against you at the Skydeck. Wonder at Cloud Gate, a gigantic, reflective silver bean at Millennium Park. Great for distorted photos of the Chicago skyline. Visit Millennium Park. Urban park meets cultural hive, if all the grey is getting you down, grab some green space at Millennium Park. Catch a baseball game at Wrigley Field, the 2nd oldest ballpark in the USA (and that’s as much as I know about baseball apart from the fact that you can eat hotdogs at baseball games, but that’s another quest). Immerse yourself in culture at one of the city’s many first-class museums. From baseball history to pre-history to modern art, you’ve plenty to choose from. Look out for free museum days. Wander along the Chicago Riverwalk or, better yet, take a boat trip on the river. I stayed at Freehand Chicago. 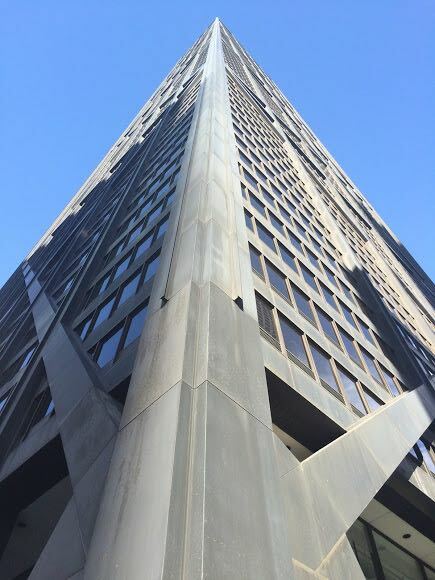 As well as an excellent location in River North, you’ll get to stay in a restored 1920’s Art Deco building that also has an award-winning cocktail bar in the lobby, The Broken Shaker. 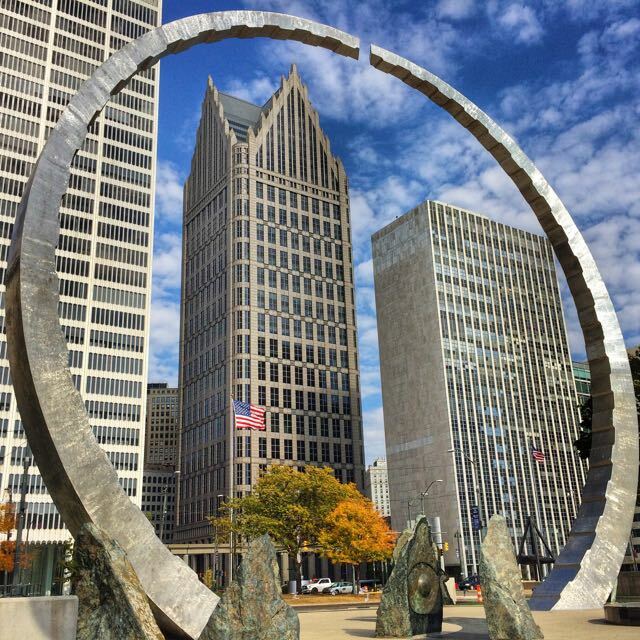 This is Detroit – surprised how nice it looks? I was too. My trip to Chicago was part of a wider trip through the USA that included a stop in Detroit. I was inspired to visit after all of the coverage online about the city’s downfall and then the slow movement towards regeneration. With a bit of hesitation, I hopped on the Amtrak from Chicago and landed in downtown Detroit. And I wasn’t disappointed. 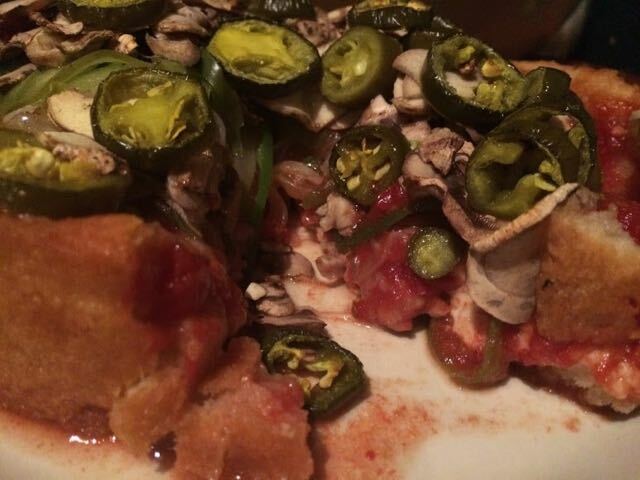 So, that’s my take on the best deep dish pizza in Chicago. 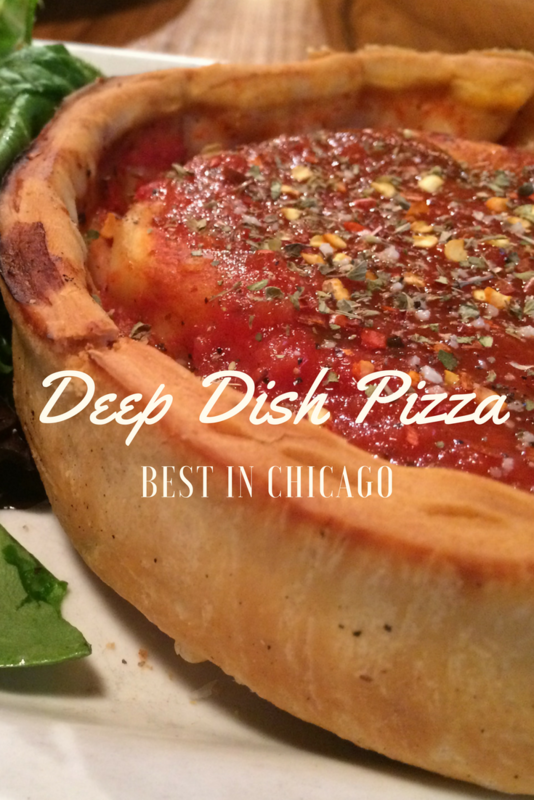 Have you tried deep dish in the windy city? Where was your favourite? Let me know in the comments below.